A replica set of the Rounders movie props in the original 5 ($1-$500) denominations & colors with 7/8inch inlays on the Circle Square mold. Also now available in 4 further denominations as shown. 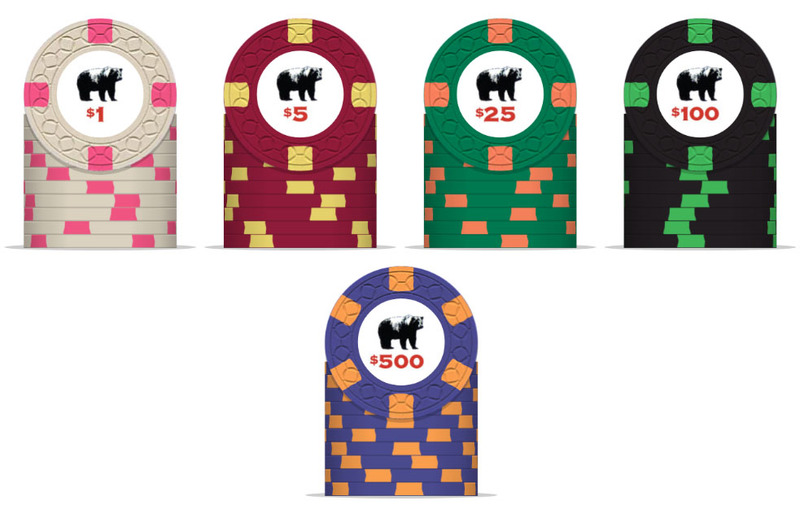 Sold in units of 100 chips or as sets of 300 or 500 in the colors shown. Inventory of these is available for immediate shipping. Alternative quantity breakdowns can be ordered at the same price subject to availability and alternative colors can be made as regular custom orders subject to our normal prices and terms and conditions. Contact us for alternative orders. Box of 100 chips (your choice of denominations from those shown - please specify at checkout or by email). Price $195 shipped. Set of 300 chips (as pictured). Contains $1 x 40, $5 x 75, $25 x 75, $100 x 75, $500 x 35. Price $545 shipped. Set of 500 chips (as pictured). Contains $1 x 75, $5 x 125, $25 x 125, $100 x 125, $500 x 50. Price $865 shipped. Sample set of 5 chips (one each $1 to $500). Price $14 shipped. Sample set of 4 chips (one each 25c, 50c, $1000 & $5000). Price $12 shipped. Sample set of 9 chips (one of each denom shown). Price $21 shipped.